July | 2016 | Mothers Against Wind Turbines Inc.
Where does the money go? Global News has presented a series of stories over the past few weeks painting a troubling picture of rural Ontario residents struggling to pay soaring electricity bills. In a particularly telling interview, Ontario’s new Energy Minister, Glenn Thibault, was forced to admit he didn’t know how many residents have had their electricity disconnected because they couldn’t pay— nor was he aware if anyone in his department was keeping track of this information. Thibault’s suggestion? Residents should conserve electricity. Besides, his government has a new support program designed specifically to help low-income Ontario residents pay their electricity bills. Relief of sorts perhaps, but more along the lines of putting one’s thumb in a dike, rather than addressing the bigger issue. All it really does is transfer these costs to the taxpayer. So where is the money going? Many millions, indeed billions, of dollars are being extracted from customers and taxpayers to fund rising electricity costs. Is it paying for research and development into electricity storage so that perhaps one day, intermittent generating sources (i.e. wind and solar) might serve a useful purpose? Is it being used to offset the hardship faced by low income Ontarians? Is it funding Ontario infrastructure development or green transit plans? No, no and no. Maybe it is funding a network of charging stations across the province, including one planned for the King Street parking lot in Picton? No. Perhaps it is helping to pay the $14,000 subsidy Ontario pays purchasers of electric cars? No. Scott Luft has been poring over the mounds of data produced by the Independent Electricity System Operator (IESO) and other sources for the past six years. Luft’s research and analysis, compiled on his website coldair.luftonline.net, is an important resource for anyone interested in understanding what has gone so terribly wrong with Ontario’s electricity market. 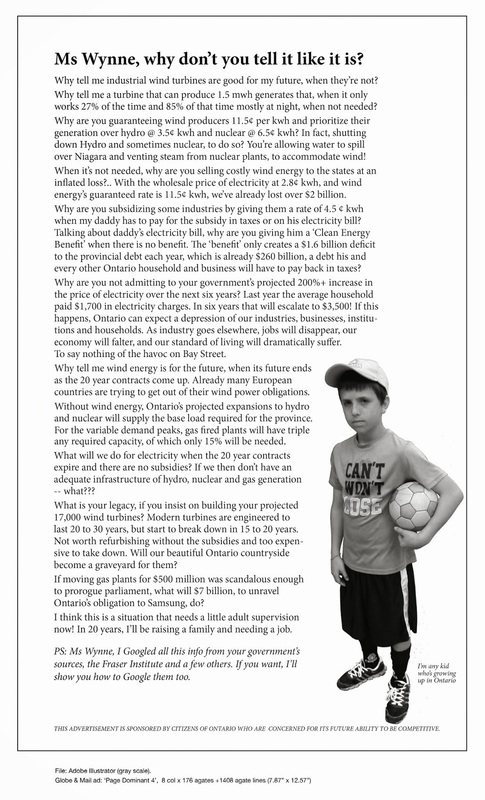 Luft has methodically revealed, and laid bare, the destructive politically driven management of Ontario’s electricity system and shows why residents will be paying for these decisions for decades to come. According to Luft’s analysis, Ontario electricity customers have subsidized wind and solar energy producers by $6.4 billion over the past decade. Worse, the rate of subsidization is climbing rapidly. We are on track in Ontario to subsidize wind and solar producers by more than $2 billion in 2016 alone. This is money going directly from consumers into the bank accounts of producers. This doesn’t include the many millions of dollars Ontario spends, or forgoes, each year offloading excess electricity to New York or Michigan from intermittent wind and solar generators it can’t control. Or the amount we pay smelters and mineral processors to spare them the high cost of Ontario electricity. Through the 1990s, Ontario dabbled in renewable energy but couldn’t persuade investors and the capital markets to participate with them. They increased incentives and tax breaks but investors stayed on the sidelines. Dalton McGuinty’s Liberals came to power in 2003 promising to close Ontario’s coal-fired generating facilities and replace this capacity with electricity generated from renewable sources, including wind and solar. While he successfully closed coal-fired plants, it was gas and nuclear-powered generation, not wind and solar, that filled the gap. (Luft’s charting, based on IESO data, illustrates this clearly). Still, investors remained stubbornly on the sidelines. So McGuinty doubled down and doubled down again. Eventually, he would agree to pay wind and solar producers as much as 25 times the market price for electricity for up to 20 years—if it appeared to be green. That did the trick. Now, long queues form seeking to join the gravy train each time the wicket opens for the province to buy more power. Despite a decade of rapid and ill-planned expansion of industrial wind and solar facilities across the province, these generators produce a paltry portion of the province’s electricity—at an extraordinarily high cost. They did, however, provide one important advantage for McGuinty and, later, Kathleen Wynne. The massive turbines and acres of solar panels have proved to be helpful political emblems signalling to urban voters their government is green. It has won this praise at a very high cost. Sadly, it is Ontario’s rural poor who are paying it. We found the opinion expressed by letter writer Dean de Jong in the July 22 edition of the Sarnia Observer both hurtful and inaccurate. With research Mr. de Jong would have realized he has misconstrued the situation. There is a problem in Dover Township and a pending problem anywhere in the area where wind turbines are constructed in this manner in this soil and rock composition. Mr. de Jong did get one thing right; the situation is about water quality. Had the Ministry of Environment and Climate Change listened to the people of Dover and reacted to their complaints, along with writing meaningful precautions into the Renewable Energy Approval for North Kent Wind 1, this situation could be reported differently and there would have been no need to push to an Environmental Tribunal. The ministry’s approach of “let them eat cake” or in this case providing farmers with livestock “bottled water” is insulting. We’re afraid it shows there is more than one person out of touch with what is at stake here. Furthermore Mr. de Jong, we assure you the Health Unit would not test this water, as you cannot see through it. It looks rather like chocolate milk but with a lot of grit. Perhaps Mr. de Jong has the time to invent a way to have a shower, do the laundry or run the dishwasher with “bottled water”. There is no hidden agenda here. Water Wells First has been abundantly clear that it’s not against the wind turbines, or any other type of renewable energy. What Water Wells First is against is having water wells that have been used for generations made useless by wind developers. The blind compliance to renewable energy demonstrated by the performance of the ministry confirms direction from a Toronto-centric ideology and no concept of what goes on in rural Ontario. Not all water comes out a tap fed by a lake, you know. Perhaps if Mr. de Jong could see past the anti-wind energy neo-Luddites, as he describes them, he might see the countryside where people have sourced clean natural ground water for generations (why would they stay if they couldn’t?) and understand the irony, in that the majority of these folks’ ancestors used wind energy (wind mills) to pump their water for all those generations. Seismic coupling – no one is making this up! People, especially rural people, have far more to do than fight to protect their wells from the government they pay for. The visual impacts of the Niagara wind installation have taken over the skylines of West Lincoln, Niagara, and Haldimand in southern Ontario. Wind projects also include miles and miles of access roads, transmission lines, hydro poles and guardrails. Even in rural lands they become a dominating industrialization feature of our landscape. Ontario has officially terminated the Ostrander Point wind project. Trout Creek and Clarington projects are also cancelled by IESO. Ontario has been paying for TV ads to promote its policies concerning climate change. One such ad is where media personality David Suzuki lectures to an audience of children that if action isn’t taken we are all doomed. Wind power generation has been held out as part of the renewable energy solution but it is done without regard to the reported harms to health and harm to the environment. Every time this ad is broadcasted adults should stop and consider if the solutions being offered are the right ones for the right problem. We need to protect our children. Our government should not be in the business of scaring children.